Many yoga poses are well suited for both prevention and healing of mouse arms. If you want to learn them properly, you can attend a yoga class regularly for a while. The whole body is worked through during the yoga exercises, and the long Yoga Nidra (deep-relaxation), which ends each class, helps to integrate every part of you and gives lasting relaxation. Nowadays many companies hire a yoga teacher for a few hours of weekly yoga for their employees. Those parts of the body which become weak and painful due to prolonged repetitive work need to be used. That is to say used differently. The wearing down of joints and muscles arises due to the same movement being repeated again and again. You might feel it, when you start to do yoga, but after a while the body loosens up. The normal reaction to stiffness and pain is not to use or burden the body where there is resistance or where it hurts. Many years ago I had a student who avoided certain yoga poses where the weight of the body rests upon the wrists. She had tenosynovitis, and wore leather bindings around the wrists. I kept telling her that if she didn’t use her wrists they would become even weaker. Eventually she agreed to give it a try, even though it went against what she had heard from experts. After six months of following precise instructions for working with the wrists in the yoga classes, the pain had gone completely, and she was both pleased and amazed that it was possible. The crane is a yoga pose where you rest the weight of the whole body on the forearms and wrists. The moment you learn to relax in the pose, something extraordinary happens. The sensation in the wrists and arms is no longer uncomfortable. It is a pose that may need training, and a knowledge of yoga is definitely an advantage. If you have, for instance, learnt the headstand and can stand completely relaxed and meditate in this pose, then a pose like the crane should not prove difficult. 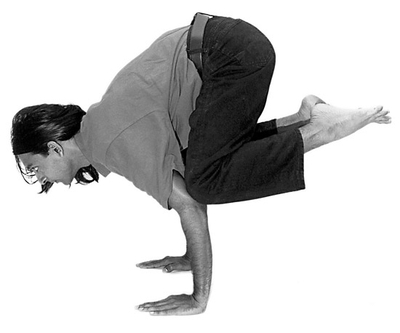 Stand in a squatting position (the nature pose). Place both hands on the floor in front of the feet. The arms are slightly bent. Position the knees on each upper arm. Lean forward, so that the toes are lifted off the floor. Stand in the pose as long as possible. Come down again and rest the arms. Do it three times altogether. There are quite a lot of suitable poses that do something for mouse arms. If you are familiar with the yoga poses we use (or see Yoga, Tantra and Meditation in Daily Life by Swami Janakananda), they are called: the double-angle pose, standing swinging pose, the clown, the reversing pose, the boat, and many other exercises in the Pawanmuktasanan programme, see photos in Yoga and the finer energy and Yoga tool-kit for computer users.